Lupa is an artist, author and amateur naturalist in Portland, Oregon. She is the author of a number of books published by Llewellyn including her upcoming book Nature Spirituality From the Ground Up: Connect With Totems in Your Ecosystem out in January 2016. For those unfamiliar with Tarot, the Death card can feel ominous and terrifying. What if there was a deck that faced it directly and in every card of the Major and Minor Arcana? In this brave new Archetypal Tarot podcast, Death is embraced early on with an interview with Lupa Greenwolf, artist and creator of the Tarot of Bones . 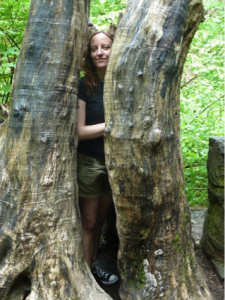 Lupa is the author of a number of books including her upcoming book Nature Spirituality From the Ground Up: Connect With Totems in Your Ecosystem out in January 2016. Lupa is also working on a new tarot deck The Tarot of Bones, a natural history themed divination deck, which will make its debut in the summer of 2016. The full 78-card deck will feature photography of Lupa’s artwork made from animal bones and other natural materials. Cyndera and Lupa discuss stones, bones and how relating with these natural presences can deepen the human connection to nature. A naturalistic interpretation of the Death Card allows us to get in touch with the ignored presence of Death in our lives and how it relates to our current relationship with the environment. 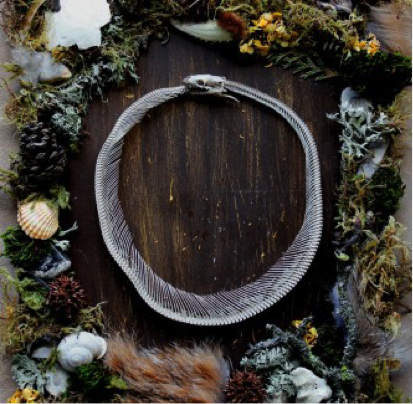 The Magician Card of The Tarot of Bones, featuring nature-found moss and a corn snake skeleton.